When you’ve been single and dating for a while, you get a little bored of the conventional places and ways to meet people. But, there are countless ways to meet other singles, including online dating, speed dating and singles encounters. What happens when these things aren’t working and you’ve exhausted all your resources? You just want to have fun and maybe meet someone in the process. Too much to ask? Not at all. Meet Market Adventures (MMA) gives singles all over North America an opportunity to do just that, meet other singles while having fun doing the things they love. They make a commitment to help “singles enjoy being single by giving them opportunities to meet other quality singles”. When I came across the site, I thought it sounded interesting and wanted to try one of their events. It was something different since I was tired of the dating scene. So I went through their events, the problem is I couldn’t decide what to do! There were so many fun and interesting events! What’s more, they were all sold out, some of them months in advance! I imagine I wasn’t the only one looking for something different. The types of events ranged from hiking, flying lessons, firing range, haunted walks, galleries, comedy nights, horseback riding, white water rafting and many others among the usual parties and speed dating events. They also have an online dating site to accompany their events. Essentially, your online dating profile connects you to other singles in your area. Going through the events, I found so many events to choose from! 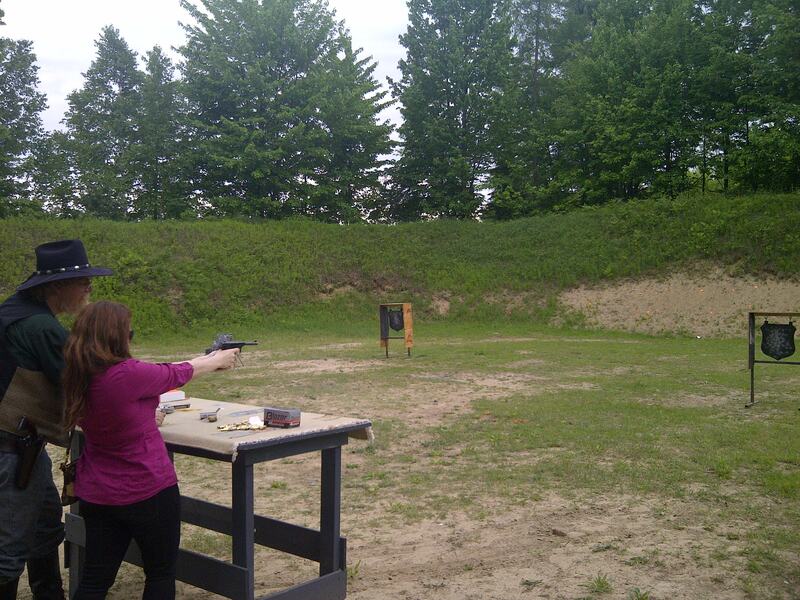 Since I always wanted to learn how to shoot a gun, I chose to take part in that one. The one thing I didn’t like was that it was a couple of months away! A lot can happen in a couple of months! But, I signed up and waited for the day to come! When I got to the event, there was a really nice welcome and the people were very friendly. The host was really nice and worked hard to keep everyone happy and engaged. The group ranged in age from 20’s to 40’s but everyone got along well regardless. There were more women than men though, but from what I learned, that’s not uncommon for these events. We got our preparatory lessons and then got to shooting. It was so much fun! It was a “western cowboy/girl” theme so we used replica shotguns, rifles and handguns. I was a definite natural (who knew!). The group interacted the whole time and it was fun meeting other people. It was good fun in a safe, positive environment. The other participants told me this is the norm for these events. That, in itself, in my opinion, is a great thing. I did ask everyone about their own experiences with MMA and they were all positive. Most of them have attended several events and had registered for more in the coming weeks. What they liked most was taking part in activities with other singles that were at the same stage of life as them. Like me, their friends were either in relationships and/or had children, so doing activities with them was challenging and not always fun. I could totally relate, one such gathering of my friends and I and the conversations were about potty training techniques. Needless to say, I didn’t enjoy myself. So, events like these are real gems. Now, it was a singles event, so the big question is was there an opportunity to meet someone? Well, seeing as there were more women than men, not really. But, there was a couple there (who I was told attend other events as well) who seemed to click. They did take a little walk together, alone, and spent the whole time together after meeting, so perhaps a love match? I hope so! So IT IS possible to meet someone at these events, but it doesn’t seem that it is the primary goal. It’s about singles getting together to have fun and meet other singles. If there’s a love match, great, if not, then that’s ok too. Whereas speed dating and other events like it are held primarily to meet someone, these events aren’t. My conclusion? I totally recommend MMA events to anyone who’s single out there. They are enjoyable, you can learn something new, the people are great and maybe, just maybe, you can meet someone doing something you love and while having fun! Nothing wrong with that! A special thank you to Meet Market Adventures for a great day! I look forward to trying more of your events soon! Please make sure to visit their site, Follow them on FaceBook for the latest and on Twitter! Previous Too Busy To Date? Oh my goodness! I have to look into this. That sounds like so much fun! I love the shooting range and white water rafting!? YES PLEASE! How great and even if you don’t make a love connection at least you spent a day having a blast. yes I totally agree … it was a lot of fun and nice to spend time with other singles as well. I am actually quite good at shooting. Where I live this kind of event would not kick off. LOL …. ya I would imagine not! Thanks for the comment! Dating should always be fun! What a fantastic idea… I love the thought of singles actually ENJOYING themselves as singles.. and what a great way to do it. When I first moved back to Los Angeles I did several “Meet Ups” – a similar concept but not only for singles. That was fun as well, and HUGE here in LA. Great post! Thanks! Thanks for the comment! What I liked was the “no pressure” environment. It makes people enjoy themselves instead of focusing on meeting someone. So much fun, so little time it seems! I’d love the shooting range! I always thought it would be fun to belong to one of those gun clubs like the cops go to on TV? You know the super, state-of-the-art clubs with moving targets and stuff? Cool….